–The Canary Island soprano will perform one of the most difficult roles in opera alongside Plácido Domingo, with tickets sold out a month and a half before the performances. On the 13th November the Spanish soprano Davinia Rodríguez will take a huge leap in her artistic career by making her debut as Lady Macbeth from the opera Macbeth by Giuseppe Verdi, a role considered to be one of the most complex and difficult in the entire opera repertoire. The Spanish singer will make this debut in Vienna at the Theater an der Wien, alongside Plácido Domingo, no less, in the title role. 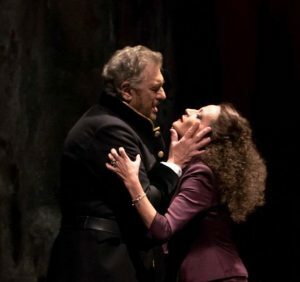 “This is, undoubtedly, a complex role, which I have been preparing for over a year with my coach, Sylvia Sass, one of the Grandes Dames of her generation.” Davinia Rodríguez, who has already sung I due Foscari in Vienna, feels “delighted to return to the musical capital, this time in this fascinating Verdi opera. My role, as well as being very technically demanding, is also very demanding on a dramatic level as Lady Macbeth is a woman whose ambition knows no limits. She even pushes her husband to murder in order to gain more political power. As with any Shakespearean character, she is fascinating, and a challenge for any singer.” Rodríguez will give three performances in this emblematic role on the 13th, 17th and 20th November and tickets have already sold out a month and a half before the premiere. The opera is produced by the Theater an der Wien and will be conducted by Bertrand de Billy and directed by Roland Geyer. Davinia Rodríguez´s international career continues its upward trajectory in a year in which she has had other outstanding triumphs such as her recent debut at the Gran Teatre del Liceu in Barcelona with Simon Boccanegra, by Verdi, – coinciding with the 50th anniversary of Plácido Domingo´s Spanish debut – and her participation this summer in the opening of the Spoleto Festival in the role of the Countess of Almaviva in Mozart´s Le Nozze de Figaro. In the 2016-2017 season, among other engagements she will also be returning to the ABAO-OLBE in Bilbao, this time as Donna Anna in Mozart´s Don Giovanni, and to the Teatro San Carlo in Naples with her Amelia Grimaldi in Simon Boccanegra, and she will be making her debut in the title role of Maria Stuarda at the Teatro Carlo Felice in Genoa.